Unlike many other mushrooms, the identification of the almond mushroom appears to have begun in the West where it was first found in the Northeastern area of the US and Canada. It’s well-known for its medicinal properties and is enjoyed for its sweet, almond like flavor and aroma. The cap varies in color from white, grey, brown and reddish-brown. 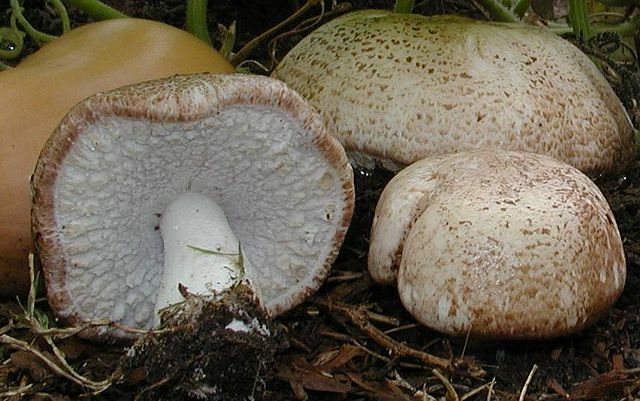 The shape of the cap in convex, the underside gills begin as white, then develop to pink as the mushroom ages, and finally to brownish-black as the spores mature. Food complements: The sweet, delicate flavor of the almond mushroom make it a food-friendly and versatile ingredient in a number of dishes. Try it in soups and stews, pasta, meat and fish, in sauces, even as a tea. Wine complements: Red, white, and rosé. The almond mushroom is well known for its medicinal properties. Research has shown that it may stimulate the immune system and offer anti-inflammatory benefits. Additional research animal and cellular research has shown it to offer anticancer properties, though more research needs to be done on humans. Clinical animal and cellular research showed positive results in the mushrooms effect in cases of colorectal and gynechological cancers, as well as cases of sarcoma, ovarian cancer, lung cancer, leukemia, stomach cancer, and prostate cancer. Other clinical research indicates that the mushroom can lower blood sugar and control insulin, as well as lower blood cholesterol. Select mushrooms that are firm with a fresh, smooth appearance. They should appear plump and firm without signs of dryness. Almond mushrooms are often cultivated in home gardens, but look for them at farmer's markets and in specialty grocery stores. They also come in dried form, such as in capsules, and in liquid form so check your local health food store or online. The sweet, delicate flavor of the almond mushroom make it a food-friendly and versatile ingredient in a number of dishes. Try it in soups and stews, pasta, meat and fish, in sauces, even as a tea. The liquid or dried encapsulated form can be taken as directed as a daily supplement. Store fresh mushrooms in the refrigerator for up to 5 days.